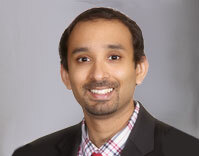 Dr. Seshadri is a specialist in shoulder, elbow, hip, and knee surgery. He is fellowship trained in shoulder and elbow surgery from the University of Pennsylvania, and also did his residency at the acclaimed University of Pittsburgh, which has trained many of the current leaders in Orthopaedic Surgery. He believes in treating patients like he would his own family- with empathy and care. His approach to treating most conditions is conservative management and surgery is only a last resort when all else fails. He is trained in the latest arthroscopic techniques of the shoulder that treat conditions such as rotator cuff disease, instability and adhesive capsulitis. For arthritic shoulders, he is well versed in performing total shoulder arthroplasty as well as reverse total shoulder arthroplasty. In addition to his shoulder training, he has expertise in total joint arthroplasties of the lower extremities- specifically the hip and knee. He firmly believes that maximizing long term outcomes of these surgeries are of critical importance. Dr. Seshadri has offices in Flossmoor and Mokena, Illinois.